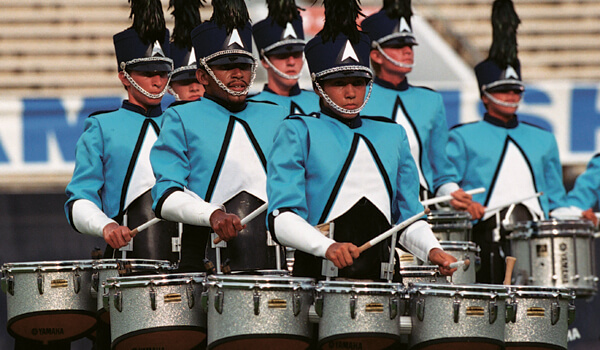 In winning a record 11th Drum Corps International World Championship, the 2003 Blue Devils became the only corps to take the title in all four decades that DCI had been in existence up until that time. Two weeks prior to the final week of the season at Orlando's Citrus Bowl Stadium, the corps had ended the remarkable 64-show win streak amassed by the Cavaliers, a streak that started with the final show of the 2000 season. 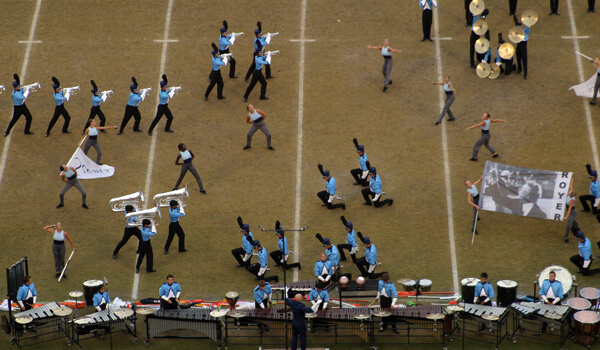 Also in 2003, Spirit from JSU moved up from 14th in the Quarterfinals competition to 12th in Semifinals, putting the corps in the World Championship Finals for just the second time since 1990. In Semifinals, Spirit did two things that got the audience's notice; the corps added a longer rendition of "Let It Be Me" to the show and also added a photo tribute flag depicting brass instructor and arranger Jim Ott, who tragically passed away while on tour with the Spirit in 1980. For the first time all season during the Finals, the corps warmed up on the field to "Georgia On My Mind," eliciting another huge response from the audience. The "welcome back" from the fans was loud and enthusiastic. Many felt it was time Spirit returned as a finalist and indeed, "Time" was the title and theme of the show. Prior to the start of the production, the color guard members swayed their arms in a locked, straight fashion as if the pendulum of a grandfather clock. A single chime rang out seven times and the horns came in with brief hints of "Auld Lang Syne" and Cyndi Laupner's "Time After Time" from her 1984 album, "She's So Unusual." These time-related snippets led into John Barry's "Somewhere in Time" from the 1980 romantic time travel movie of the same name, starring Christopher Reeve and Jane Seymour. Earlier in the season, a giant hourglass figure spread across much of the field in this section, with corps members passing through the bottleneck as if grains of sand. Australian Ralph Hultgren's dynamic "Whirr, Whirr, Whirr!!!" provided the musical backdrop for the movement titled, "Vertical Momentum." During this segment, the low brass formed the circle of an analog clock as the 15 color guard members inside moved about as the two hands of the clock. The publisher of the work notes that the piece typifies the demands of everyday life, which is continuously moving forward in a flurry of activity. During this work, hints of Jim Croce's pop tune "Time in a Bottle" were heard, with a reprise of the moving hands of the clock, this time by the low brass. A number of tearjerker emotional moments were offered during the segment titled, "A Look Back in Time," subtitled, "Horizontal Time." This movement was set to the tender and haunting "October" by composer Eric Whitacre, commissioned for and premiered in 2000 by a consortium of 30 Nebraska high school bands. This was the corps' salute to those from other corps who were no longer with us, taken from the drum corps community well before their time. To make that tribute, Spirit unveiled a flag featuring a photo of 27th Lancers' guard and drill designer George Zingali, with accompanying music of "Danny Boy" briefly wafting over the field. This was followed by a snippet of Santa Clara Vanguard's "Send in the Clowns," accompanied by a photo flag of that corps' founder and longtime director Gail Royer, with the cymbal line members forming the traditional Vanguard "V" with their cymbals just behind the flag. A flag of the Bridgemen passed in the background, and other flags, one word per flag, spelled out, "Seems Like Only Yesterday." The movement ended with a small snippet in the brass of the corps' most famous work arranged by Jim Ott, "Let It Be Me." "Past Into Present," subtitled, "Rhythmic Time," was interpreted by two works from the Buddy Rich Big Band, Horace Silver's "Nutville" and Bob Mintzer's "No Jive," the latter written by a jazz saxophonist who said that he learned how to compose for jazz bands while a member of Rich's ensemble. During this production, dueling factions of Afro-Cuban and world percussion intermingled in gleeful gusto. The show ended with "Melodic Time," based on the New Age "Appalachian Morning" from the 1993 Paul Winter Consort album, "Spanish Angel." The horns formed a company front and unleashed the melody of "Let It Be Me" that had just been added to the show, along with the appearance of the Jim Ott flag as mentioned above. Those two references to the corps' storied past were enough to push the show—and the audience—over the emotional edge. For this week only, you can save on the DVD that contains this complete Spirit from JSU performance, along with all finalists from the 2003 DCI World Championships. Buy the 2003 World Championship DVD set. (Available this week only for 20% off. Regular price: $39.95.) Discount DVD offer ends Monday, Dec. 23 at 8:30 a.m. ET.